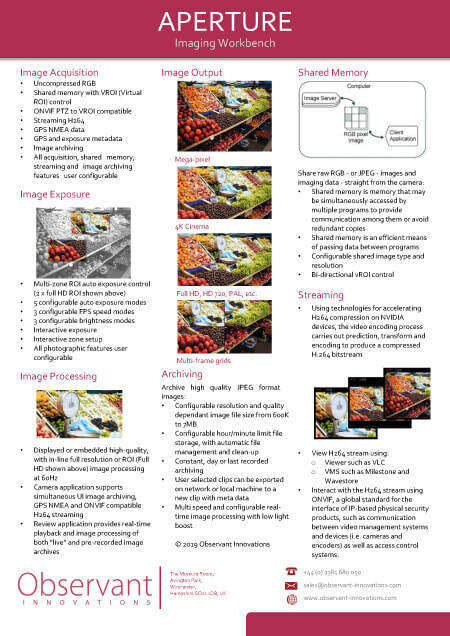 ​APERTURE is a suite of applications which sets up and controls high resolution digital cameras, and enables capture, manipulation, transmission and indexed storage of images. It can manage both directional and 360° panoramic cameras. APERTURE allows complete flexibility of viewing, with the ability to control every aspect of the camera image acquisition process. 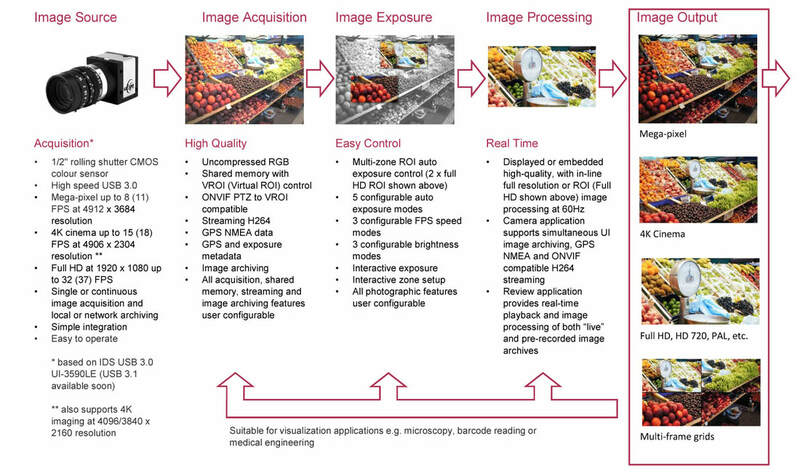 Real-time understanding is enhanced by using image processing which is independent of camera imaging acquisition and archival. A shared memory API allows customised analytics to be added to enable alerts both for expected outcomes surveillance incidents of interest. 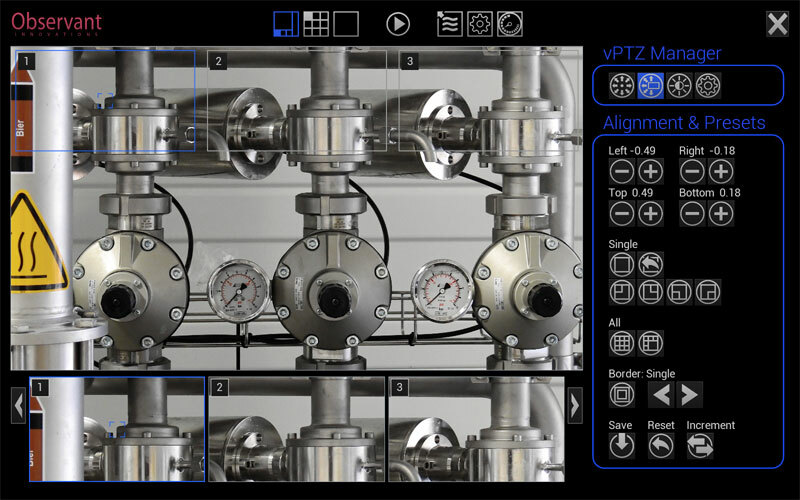 There is also the ability to add augmented reality (AR) overlays, for example to compare visible context with other sensor data. All APERTURE applications have a consistent user interface which can be used either with pointing devices, such as a mouse, or with a touch screen. The Camera application is used to setup and enable live interactive or automatic control of a camera. It can be used to initiate the storage of images and image streaming to remote locations. APERTURE includes a hierarchical filing system, which is organised to be efficiently accessed by other APERTURE and 3rd party applications using time as the primary index. The Camera application may be configured to meet unique operational requirements, for example, to store images and other data in a single archive, create a new archive for each new day of operation, or even to create a new archive each time the application is run. 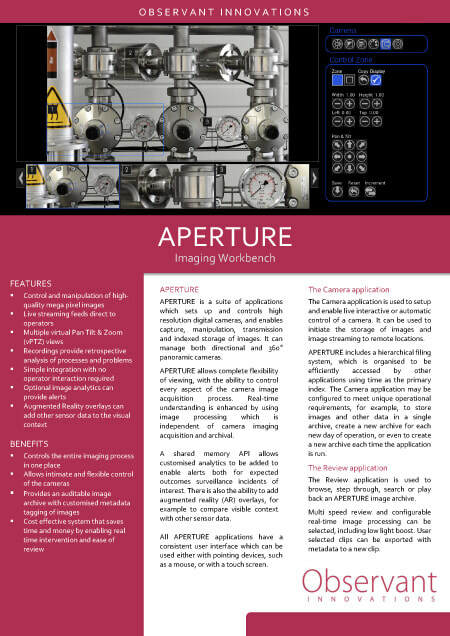 The Review application is used to browse, step through, search or play back an APERTURE image archive. 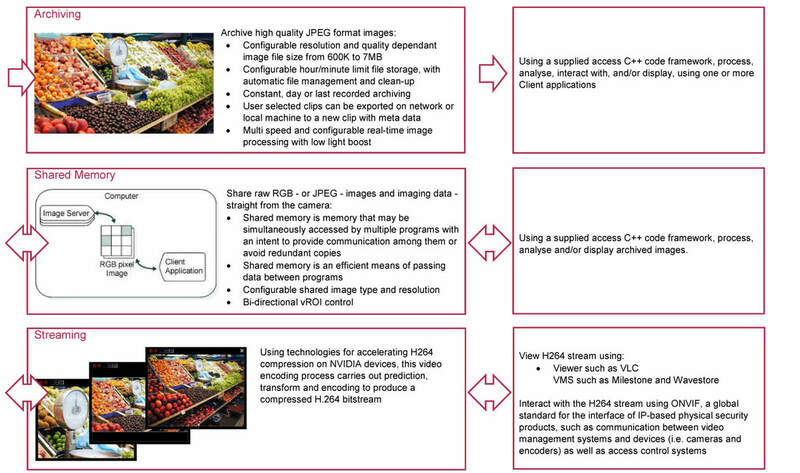 Multi speed review and configurable real-time image processing can be selected, including low light boost. User selected clips can be exported with metadata to a new clip. Click on either of the images to download.